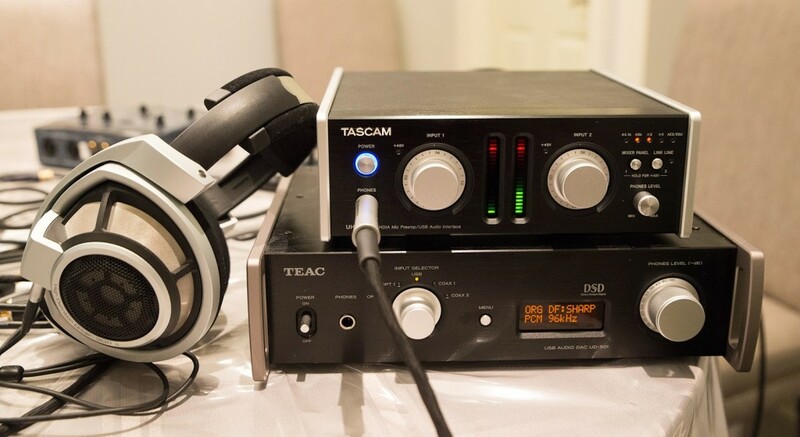 The Tascam UH-7000 is a 4 channel audio interface with HDIA Preamps, ready to connect by USB, the audio interface is a perfect addition to Tascam’s already wildly successful line of engineering hardware. The UH-7000 is a compact 6×6 box with 2 aluminum side panels and a large face with 2 metal knobs, which is always nice compared to any plastic hardware. The face also features 2 large LED’s that give the user visual information that also gives overload information (2 seconds of red on the top). Like all of Tascam’s signature equipment the quality and care of manufacturing has been very well thought out, never producing too much heat, or any annoying buzzing or hums, the UH-7000 is a solid piece of equipment, ready to take years of constant use. As far as sound goes, Tascam has never been a let down. The trademark high and low shelf’s flow very smoothly with crisp and clear tones, an undeniable reflection of the quality by the company that has been around for decades. The preamps are ready for anything from MIDI keyboards, live instruments, microphones, etc. We personally used the Tascam with the Neumann TLM-102 . Easily able to be connected and blasted through your studio monitors with no type of prior professional experience, the thing is basically plug n play.. No hassle in set up. The most impressive feature of this interface is the gain, the flexability of this function is a huge plus compared to some others. The onboard analog to digital works fantastic, but doesn’t do anything unexpected. This audio interface is a perfect standard for any producer looking to add a new addition of gear to their set-up that is going to stay for the next decade. Truly applicable to any type of user, we’re confident the Tascam won’t disappoint anyone. You an buy yours HERE with a 1 year company warranty.